Download "Clinical Trials of Disease Modifying Treatments"
1 MS CENTER CLINICAL RESEARCH The UCSF MS Center is an internationally recognized leader in multiple sclerosis clinical research. We conduct clinical trials involving the use of experimental treatments, as well as observational studies that help better understand the natural history of the disease. We are trying to understand what role genes, the environment and the immune system have in multiple sclerosis and other neuroimmunological diseases. Although our primary clinical research focus is on MS, we also study other diseases such as neuromyelitis optica (NMO), optic neuritis, transverse myelitis, encephalitis and sarcoidosis. Clinical research studies include only individuals who choose to participate in them. If you are interested in research conducted at our Center, please inform your neurologist or nurse. 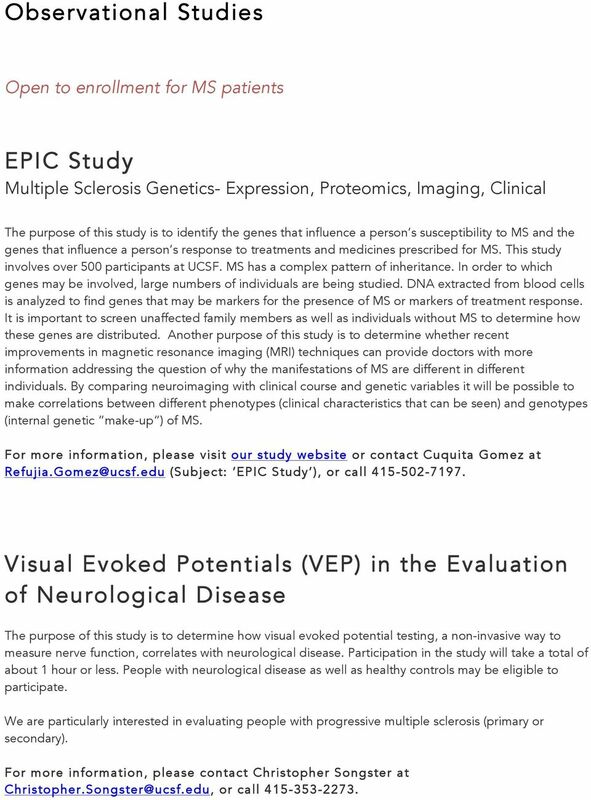 If you are currently a patient of the UCSF MS Center, some of these studies may be completed during your clinic visits. Some research studies are open for enrollment even if you do not receive your neurological care at UCSF. Should you be interested in a research study, you can be given an unsigned copy of the study consent form to think about and discuss with anyone before making your decision about entering the study. Please take your time to decide whether you would like to participate, and ask the study doctor or study staff to explain any words or information in the consent form that you do not clearly understand. 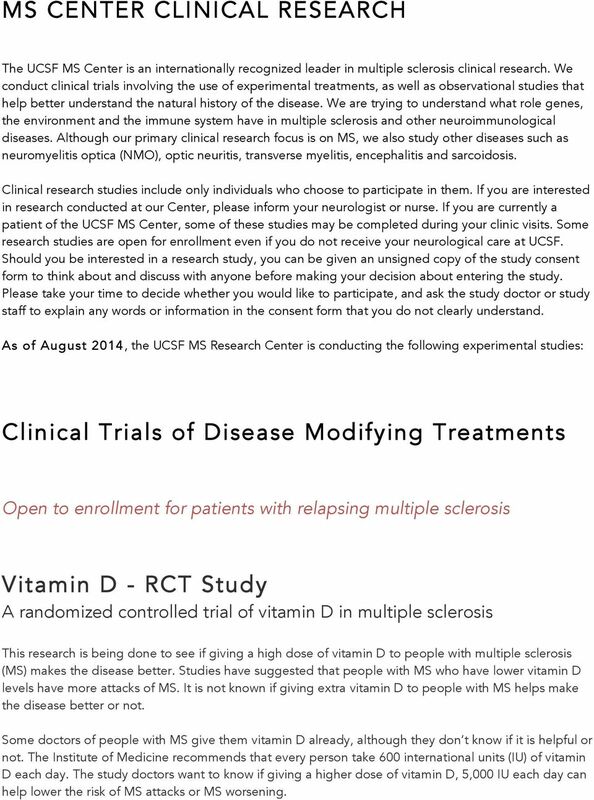 As of August 2014, the UCSF MS Research Center is conducting the following experimental studies: Clinical Trials of Disease Modifying Treatments Open to enrollment for patients with relapsing multiple sclerosis Vitamin D - RCT Study A randomized controlled trial of vitamin D in multiple sclerosis This research is being done to see if giving a high dose of vitamin D to people with multiple sclerosis (MS) makes the disease better. Studies have suggested that people with MS who have lower vitamin D levels have more attacks of MS. It is not known if giving extra vitamin D to people with MS helps make the disease better or not. Some doctors of people with MS give them vitamin D already, although they don t know if it is helpful or not. The Institute of Medicine recommends that every person take 600 international units (IU) of vitamin D each day. The study doctors want to know if giving a higher dose of vitamin D, 5,000 IU each day can help lower the risk of MS attacks or MS worsening. 5 Neuroimmunology Banking Studies Banking of Cerebrospinal Fluid and/or Peripheral Blood from patients with Multiple Sclerosis, Neuromyelitis Optica and other neurological diseases or blood from healthy subjects The purpose of this study is to collect samples that may aid in better understanding disease mechanisms of inflammation of the brain and spinal cord. In addition, these samples may help identifying markers relevant to such diseases. Blood from patients or healthy donors will be collected. CSF will be strictly obtained during procedures for the diagnostic workup of patients in the Department of Neurology at UCSF. Blood will be mainly obtained during diagnostic workup but may also be obtained for research purposes only. A portion of the samples that are collected as a part of this study may be used now or in the future for research purposes with the goal to have a constant flow of materials from human subjects required for basic laboratory research. 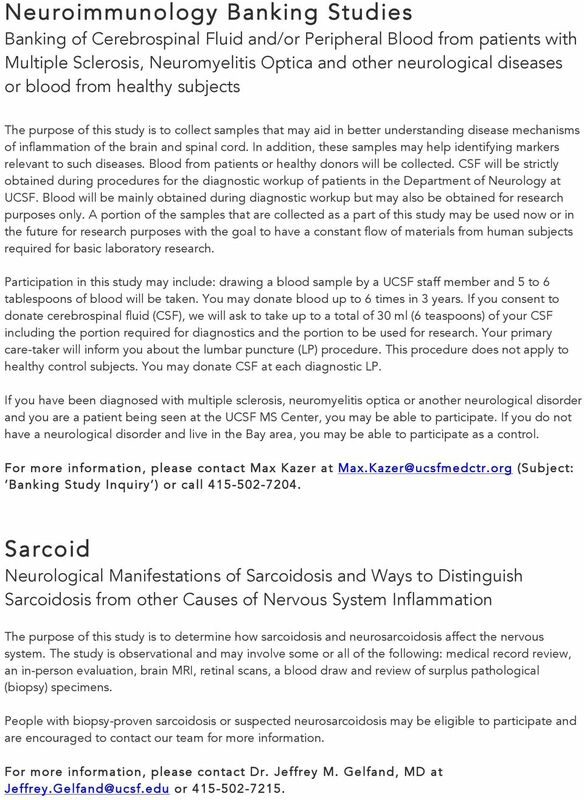 Participation in this study may include: drawing a blood sample by a UCSF staff member and 5 to 6 tablespoons of blood will be taken. You may donate blood up to 6 times in 3 years. If you consent to donate cerebrospinal fluid (CSF), we will ask to take up to a total of 30 ml (6 teaspoons) of your CSF including the portion required for diagnostics and the portion to be used for research. Your primary care-taker will inform you about the lumbar puncture (LP) procedure. This procedure does not apply to healthy control subjects. You may donate CSF at each diagnostic LP. If you have been diagnosed with multiple sclerosis, neuromyelitis optica or another neurological disorder and you are a patient being seen at the UCSF MS Center, you may be able to participate. If you do not have a neurological disorder and live in the Bay area, you may be able to participate as a control. 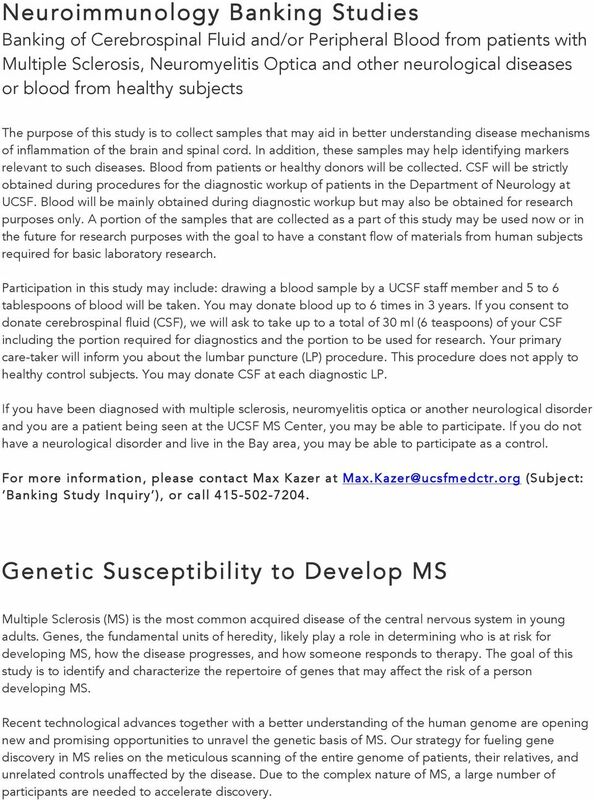 For more information, please contact Max Kazer at (Subject: Banking Study Inquiry ), or call Genetic Susceptibility to Develop MS Multiple Sclerosis (MS) is the most common acquired disease of the central nervous system in young adults. Genes, the fundamental units of heredity, likely play a role in determining who is at risk for developing MS, how the disease progresses, and how someone responds to therapy. The goal of this study is to identify and characterize the repertoire of genes that may affect the risk of a person developing MS. Recent technological advances together with a better understanding of the human genome are opening new and promising opportunities to unravel the genetic basis of MS. Our strategy for fueling gene discovery in MS relies on the meticulous scanning of the entire genome of patients, their relatives, and unrelated controls unaffected by the disease. Due to the complex nature of MS, a large number of participants are needed to accelerate discovery. 6 If you have been diagnosed with MS, have a family member diagnosed with MS, or are healthy and could serve as a control, you may be eligible to participate. Participation in this study will take approximately three hours and will require a blood draw. This is a nationwide study; participation does not require that you live near San Francisco, CA (except for healthy unrelated controls). To participate in this study or to request additional information, please complete this brief survey. Observational Studies Open to enrollment for patients with neuromyelitis optica or neurosarcoidosis Neuromyelitis Optica T Cell Recognition of CNS Autoantigens in Multiple Sclerosis and Neuromyelitis Optica Multiple sclerosis (MS) and neuromyelitis optica (NMO) are believed to be autoimmune conditions in which the immune system (which normally helps fight infections) causes damage to the nervous system. Recent discoveries have shed new light onto how this may be occurring, but the process is still not completely understood. Newer studies have also suggested that intestinal bacteria may also be involved in these conditions. This study is being conducted to get a better understanding of how certain types of white blood cells (T cells) and intestinal bacteria may be involved in MS and NMO. If you have been diagnosed with MS, NMO, or if you are healthy, and you are above the age of 13, you may be eligible to participate in this study. If you are eligible, and if you agree to take part in this research study, we would like to collect a blood sample, and an optional stool sample. By studying these specimens, we hope to learn more about what causes MS and NMO, to expand our knowledge of what happens during the course of these diseases, and hopefully to find better treatments in the future. Participation in the study should take less than two hours. If you would like more information, please contact Dr. Scott Zamvil (Principal Investigator) at or , or Collin Spencer (Study Coordinator) at or You may also visit the Zamvil Laboratory website. 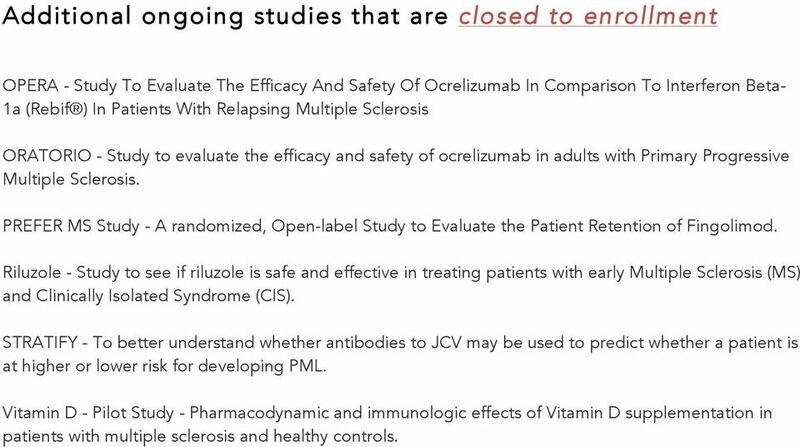 8 Additional ongoing studies that are closed to enrollment OPERA - Study To Evaluate The Efficacy And Safety Of Ocrelizumab In Comparison To Interferon Beta- 1a (Rebif ) In Patients With Relapsing Multiple Sclerosis ORATORIO - Study to evaluate the efficacy and safety of ocrelizumab in adults with Primary Progressive Multiple Sclerosis. 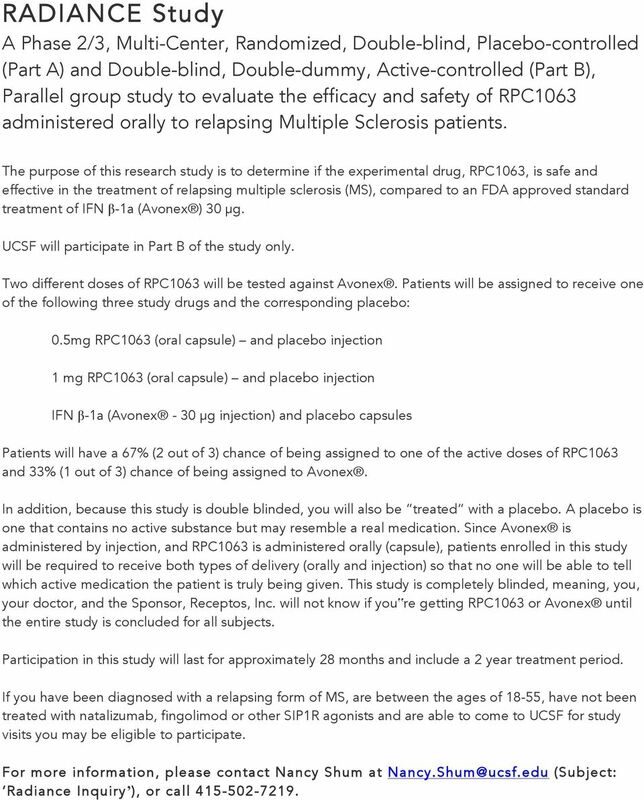 PREFER MS Study - A randomized, Open-label Study to Evaluate the Patient Retention of Fingolimod. 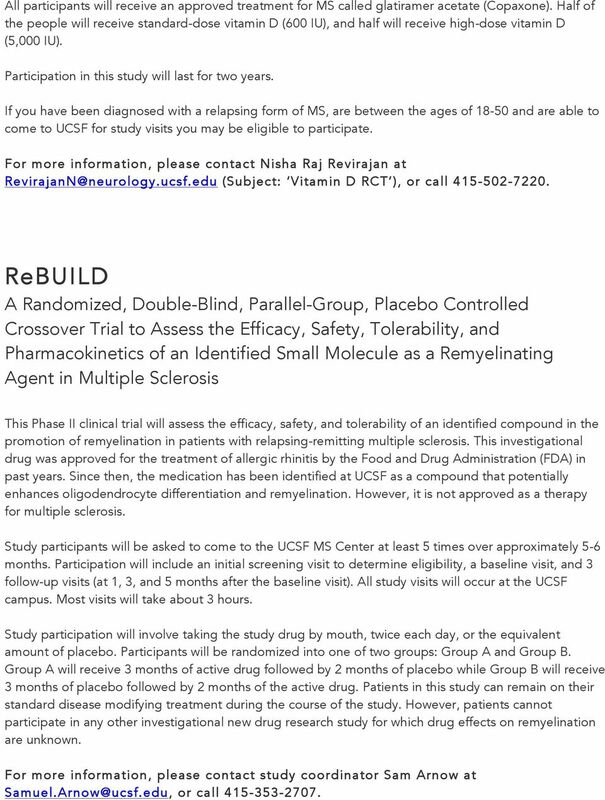 Riluzole - Study to see if riluzole is safe and effective in treating patients with early Multiple Sclerosis (MS) and Clinically Isolated Syndrome (CIS). STRATIFY - To better understand whether antibodies to JCV may be used to predict whether a patient is at higher or lower risk for developing PML. Vitamin D - Pilot Study - Pharmacodynamic and immunologic effects of Vitamin D supplementation in patients with multiple sclerosis and healthy controls. 2.1 Who first described NMO? Novel therapeutic approaches in multiple sclerosis Neuroprotective and remyelinating agents, the future of clinical trials in MS? Understanding. Multiple Sclerosis. Tim, diagnosed in 2004. MS Learn Online Feature Presentation Understanding MS Research Robert Lisak, MD. Tom>> And I'm Tom Kimball. Welcome to MS Learn Online. Optic Neuritis. The optic nerve fibers are coated with myelin to help them conduct the electrical signals back to your brain. Multiple sclerosis. Great Ormond Street Hospital for Children NHS Foundation Trust: Information for young people. What is Multiple Sclerosis? About MS. An introduction to. An introduction to multiple sclerosis for people who have recently been diagnosed. What is MS? Is it common? Jeffrey Dunn, MD, a clinical neuro-immunologist at Stanford School of Medicine talks about a new oral option for MS patients.